In every application, with every customer, Filmtec seeks to offer the optimum balance of quality performance, reliability, and cost. 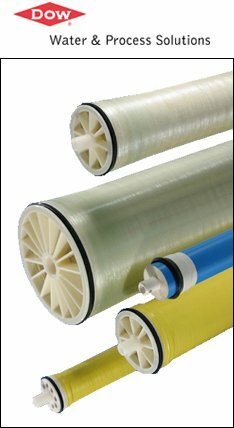 And with the unique capability of Filmtec's nanofiltration (NF) membranes we enable you to customize the water composition you require as well. Filmtec nanofiltration membranes have a pore size in the order of nanometers (10 angstroms). Nanofiltration membranes typically operate at less than 100 psi (7 bars). Filmtec offers a portfolio of nanofiltration membranes that can remove organics with molecular weights greater than 200 (e.g. Total Organic Carbon (TOC) and disinfection by-products) while allowing varying amounts of salt and hardness passage. Removal of TOC, nitrates, pesticides, herbicides, hardness, iron, salts, and THM precursors. Removal of color, TOC, and THM precursors, with medium to low calcium passage and high salt passage. Note: Permeate flow rates for individual elements may vary +/-30%, and will also be influenced by feed water conditions.